Fibular hemimelia is characterized by a limb length discrepancy. Limb length discrepancies are corrected with limb lengthening, a surgical procedure to lengthen bones. Lengthening by external fixator involves two phases: distraction phase and consolidation phase. The distraction phase is also called the lengthening phase and is the time period from the operation until the adjustments of the lengthening are concluded. The consolidation phase begins at the end of the distraction phase until the external fixator is removed from the leg. For more information on the biology of limb lengthening, see the Limb Lengthening Center. In most children, for a single level of lengthening, the total external fixation time is equal to one month per centimeter. This is an approximate average time and can vary between individuals; some individuals take more than one month per centimeter and some less than one month per centimeter. During external fixation time, approximately half of it is the distraction phase and half is the consolidation phase. Prior to the distraction phase, there is a waiting period of typically five to seven days, known as the latency period. During this time, the patient is usually discharged from the hospital after approximately three to four days and begins physical therapy. The lengthening rate for tibial lengthening in fibular hemimelia is usually 0.75 millimeters per day. This rate should be adjusted according to bone formation and range-of-motion of the joints. During the lengthening, it is essential to undergo physical therapy. 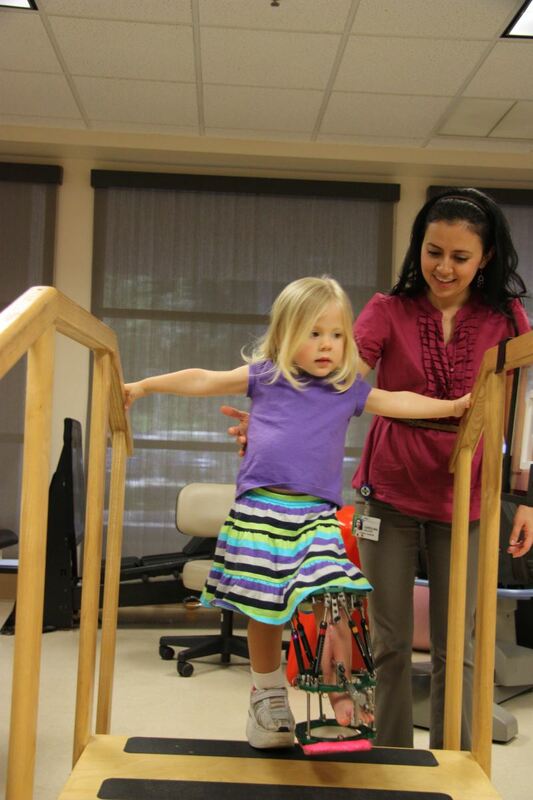 Physical therapy is required for almost all patients who are undergoing limb lengthening. Physical therapy for fibular hemimelia focuses on knee and toe range-of-motion and gait training (walking). The tendency during the lengthening is that muscles get tighter causing the toes to flex and the knee to bend. If these joints are not diligently stretched, they will become contracted (stuck) in the flexed position. After the SUPERankle, the foot is fixed and pinned in a 90-degree position. The foot must always be fixed with external fixation during lengthening for fibular hemimelia. Even though the SUPERankle procedure leads to stability of the ankle joint, lengthening will destabilize that ankle joint and cause the ankle to begin dislocating and the foot will return to an equinovalgus position. The only type of FH that can be considered for lengthening without foot fixation is Type 1. All of the other types must have foot fixation during lengthening. In Type 1, where the foot is not immobilized, a splint such as a cast or special boot should be used to maintain the foot position at 90 degrees. Physical therapy in such cases should focus on stretching the ankle to stretch the Achilles tendon. In older children, where implantable limb lengthening is considered and the foot and ankle are not immobilized by the implantable device, a special cast or brace must stabilize the foot and ankle at 90 degrees. In some cases a specialized spring-loaded splint is required during the lengthening to prevent knee flexion contracture. For the toes, a special removable toe splint or forefoot splint is custom-made before the lengthening begins and is used on a regular basis. If simultaneous femur and tibia lengthening are carried out, then the knee extension bar needs to be applied every night to prevent knee contracture, and knee range-of-motion is even more imperative for both flexion and extension. Femoral lengthening can be combined with tibial lengthening. This is only carried out when there is a combined shortening of the femur and tibia, and femoral shortening is of a significant magnitude. In such cases, it is not unusual to perform the SUPERankle procedure along with femoral lengthening. In these cases, lengthening of the rectus femoris and fascia lata structures are also performed. If femoral lengthening is considered, it is factored into the surgical life plan.